(1 Customer Reviews) | Write Review 52 issues per year 75 years on we re-live the reporting of the run up to and the development of WW2 from the pages of the original weekly ‘The Aeroplane’. Made available digitally and re-issued each week. 75 years on we re-live the reporting of the run up to and the development of WW2 from the pages of the original weekly ‘The Aeroplane’. Made available digitally and re-issued each week. 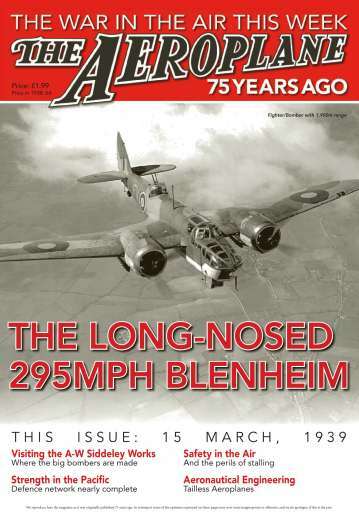 You'll receive 52 issues during a 1 year Aeroplane Weekly - The War in the Air 75 years ago magazine subscription. First Class Insight into the panic and the build up for the RAF and British Commonwealth Air Forces in the run up to WW2, some great articles found here and some history I was not aware of, such as the Civil Air Guard. You'll receive 52 issues during a 1 year Aeroplane Weekly - The War in the Air 75 years ago magazine print subscription.